today I like to talk a little bit about a relatively new sculpting putty and give you the opportunity to try out some of it for yourself... along with the chance of winning some other goodies! Around 10 days ago I received a pretty packed parcel by Masq Minis. Nice! Goodies! I love to unpack stuff, it's always like christmas! The gorilla is really cool, like a boss! First, let's compare that to other wide spread polymer clays. The easiest thing to compare when checking out clays is the price. 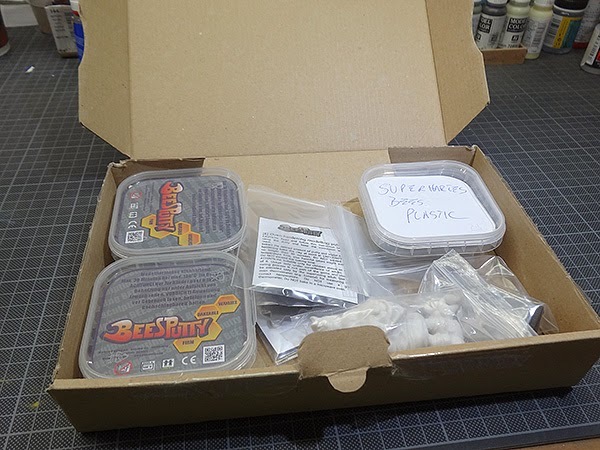 BeeS Plastic is a bit more expensive compared to other clays, but to be honest, 100g of clay is very much when sculpting miniatures or "small" busts. Especially for 28mm or 54mm figures a 100g pack of clay will last you very long! So the price is not a real killer argument, especially when you get the 2kg pack it almost beats the very cheap Super Sculpey Firm. But more important than the price (at least for me) are the properties, so let's check them out. 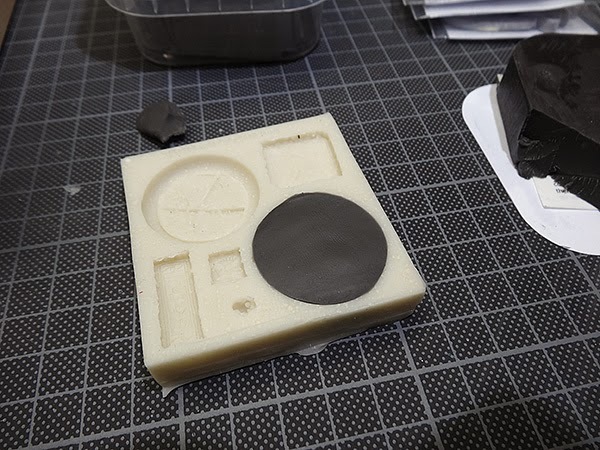 Let's start easy ... with the stamps, a good first try for the material and I found the idea of stamping gaming bases pretty interesting. 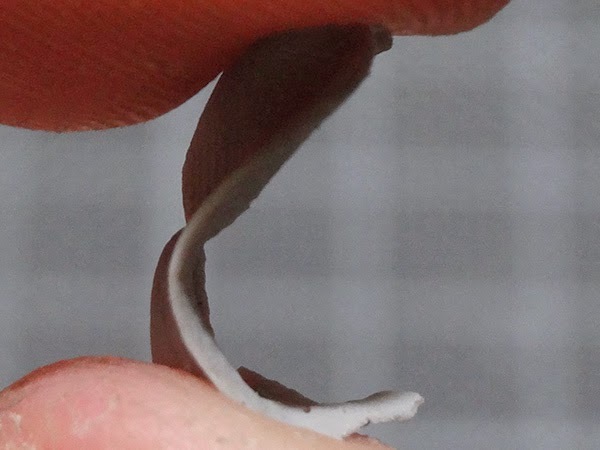 This is the stamp form made from a very flexible and robust material, I guess it's some kind of silicone rubber. ... and pushed the ball into the form. To bake it, just peel it out and place it on a wooden board. 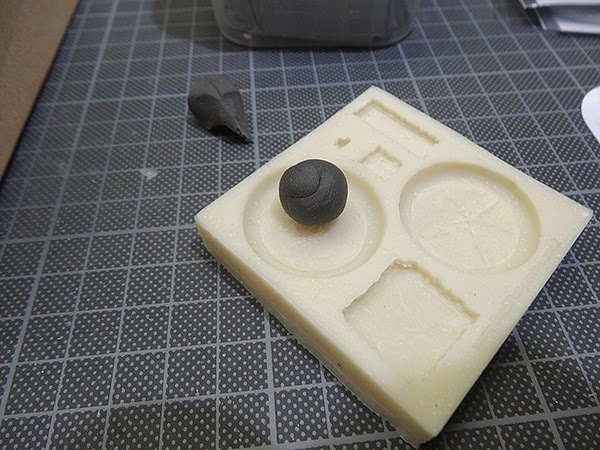 I made some more test shapes from grey and black putty and baked it all at around 120°C for 25 min. Ok, so here you see the gaming base, looks like some mayan pattern. I also shaped two very thin "banners" and a horn. I wanted to test the properties of the material, so I made different shapes to test out stability, flexibility, hardness and how well it can be cut and sanded. Describing a sculpting clays properties is kind of difficult. Comparing it to other sculpting clays is a bit easier but this stuff is pretty unique, before and after baking. When baked it is very "plastic" like (hence the name). It's very strong and almost "impossible" to break. It's very hard, but at the same time flexible. As you can see with the horn, cutting and sanding it is very easy and you can really polish it back up. The rough shape of another horn was cut using a hobby knife, sanded a bit and finally gave it a quick polish up using a soft toothbrush and a veeeeeeery small amount of Vaseline. ... or bend it that way bend without braking, a very good property for a clay. The same goes for the baked banners and they are very thin! You can see light coming through it when put against a light source, so you can imagine how thin they are. But still you can bend it in a very strong angle without breaking and after bending it returns to it's original position. I really like that property, it's makes the clay very good to make original miniatures or busts that will be casted as the sculpture can take quite a beating before breaking or chipping. Now for the properties before baking - the sculpting qualities. For sure the second most important part (at least for me, if a clay is brittle or unstable after baking I cannot use it for my sculptures as they have to be solid enough to be casted or carried around and be painted). How to describe this clay? It's kind of soft-rubbery, a bit like fimo, but on the other hand very different - It's a lot more wax-like. It sticks very well to itself and to wire, it can get very soft using a microwave and it's very "flexible". To test it out for myself, I started sculpting a bust. Just took some thick wire, stuck it into a piece of cork and go! Started with blocking in some basic volumes and shapes, the putty really feels nice and is very easy to work with. 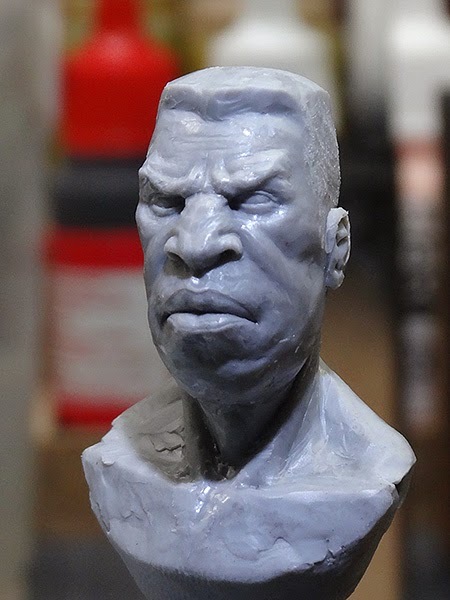 For my personal taste and first impression it works much better than my mix I use since the last sculpting workshop with Pedro Fernández ( Fimo Classic + Super Sculpey Firm - A really good mix, very stable and flexible after baking). At least for this bust. ... a bit further in the process. At the moment I have a lot of work in progress projects going on with other sculpting clays, but I think when they are done I use BeeS Putty Plastic in more projects. The putty holds detail very well and is very easy to smooth using some kind of balm (eg. Petroleum Jelly/Vaseline) or using white spirit, turpentine or orange-turpentine (just smells awesome and is less aggressive). 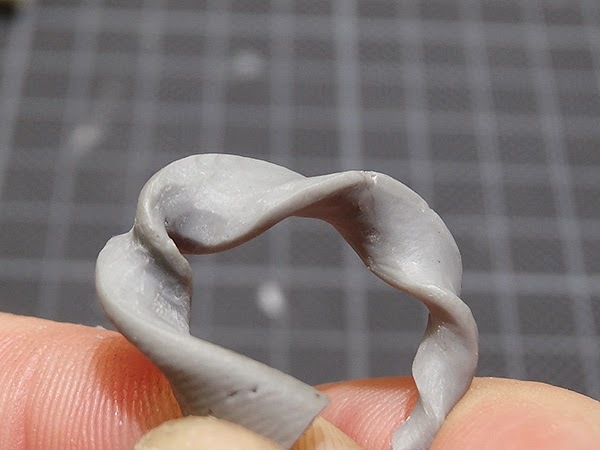 But the properties of the putty allow it to also smooth it very easily with the normal sculpting tools. Overall, I am really happy with this new option at my arsenal, I really like the properties it has while sculpting and even more after baking... it's really hard to break the sculpt at all! 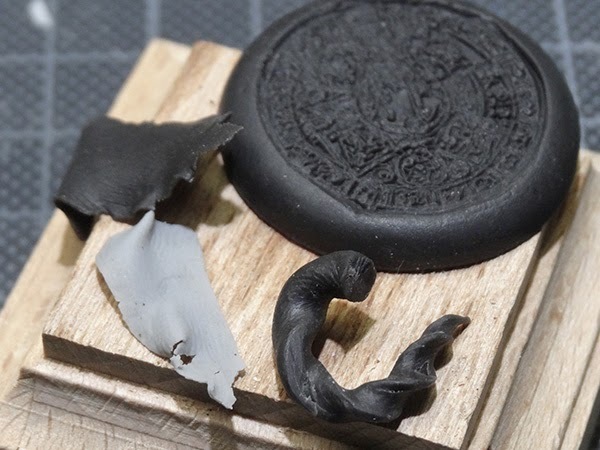 And I didn't find any negative sides about it, maybe one thing that I have found worthy of saying it here in the end: the putty get's very soft when baking it, so I advise you to watch out for "floating" parts, they need some kind of support or they will bend in the oven. 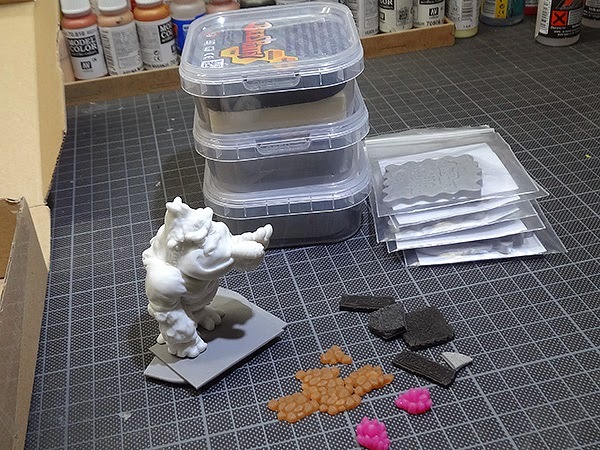 You can get your BeeS at the website of Masq Mini, they also offer a lot of great sculpting tools and other nice stuff, be sure to check it out if you are into sculpting or conversions. Now to the part you have all been waiting for, getting free stuff! All the prizes are sponsored by Masq Mini! Thanks a lot Stefan! So, how do you participate? Very easy this time, just post a comment here with your reason why you want to have this stuff. The best 10 answers will be chosen, top 5 will get a gorilla figure and top 3 will get a Jamal bust additional to a pack of BeeS Putty Plastic. The winners will be announced in 1 week from now! Good Luck and have fun sculpting! PS: Find this review linked up in the review section! One day 2 gorillas told me to do the monkey. And I did it. For the video you have of me in your computer and because you are the kindest guys in the world, may I ask you a prize ? Distribution of BeeS Putty to me would be a good idea, due to the socio-economic situation with the bees. As we all know, more and more colonies of bees are dying for the lack of work. So dispersal of BeeS Putty and the following, inevitable demand for more, will help to stabilize the income for the now starving and dying bees. So help the bees, create more work and live for a better future! 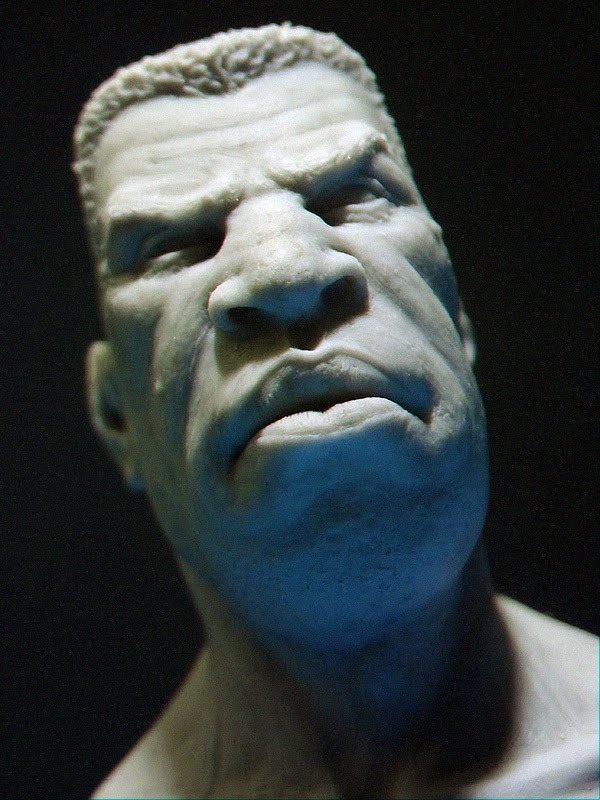 I want this stuff cause I have in mind a conversion for Jamal bust that I must bring to life. Would be great to help me get into sculpting and who doesn't want a smoking gorilla! I'm sure with the putty get acceptable results. Although I have the same skill a gorilla. I love the gorilla, and if I'm not top 5 I can try making one myselfe (that will be funny). I'm always looking for cool materials and since i started sculpting recently i believe that it will be a huge plus for me, if i win !!! My sculpting skills need improvement. With this prize pack I can practice by sculpting larger cigars for the gorillas. And possibly funky top hats. I am a collector of the most realistic animal sculpts out there. And as we all know, gorillas are heavy smokers. So I need to get my hands on this one! I don't need it. But i want it. And in the end, i could shock my wife when she finds a monster in the oven. I have just started sculpting my first minis with fimo...I think it would be awesome to try this putty to...also I am allergic to bees so this is the closer I could get to them.. 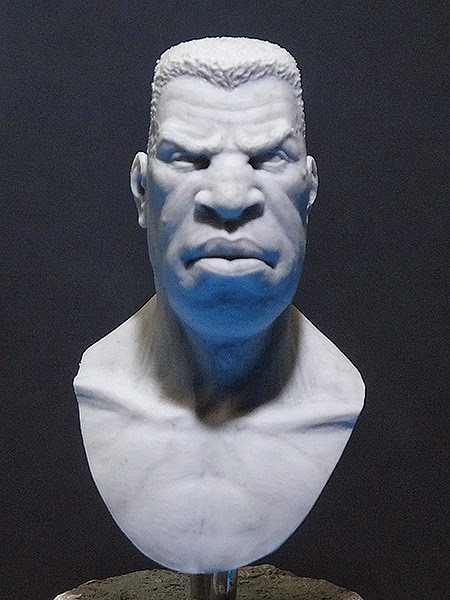 I would really like to improve my sculpting skills, I've been planning on starting some busts to learn new techniques, so this prize would be a great way to start me upon that road of creativity. And then... Maybe one day... When the right supplications and sacrifices have been made to the Outer Gods... I, like Finster from the original power rangers series, will have the power to create an army of living putty soldiers and monsters to try and take over the world!!! But seriously, after this article's review, I'm surprised on the characteristic of this putty and really gotten excited to have one to try out. Awesome review as always, the bust looks great so far. I'd like some BeeS Putty because I've been swinging through the jungle trying to find a suitable clay to start learning how to sculpt with! On my journey I've met many Apes that have suggested Fimo or Mud or even some strange stuff called Milliput! When I looked into the water, the cave went quiet and even though no wind could be felt, my jungle explorer cape started to move back and forth. A soft low hum began to resonate around the chamber and with each passing moment I thought I could hear words beginning to form, like something from a fairy tale. All of a sudden the noise and motion stopped as abruptly as it had started. I turned away from the pool to see if I was still alone and when I looked back, across the surface of the water there was a rippling image of a face. I was so startled that I jumped back and made a very embarrassing squeaking noise and dropped the banana that I had been carrying. Starting back at me from the surface of this magical pool was the face of an old grizzled Ape. The face looked at me for a moment and then said two words...BeeS Putty. So, based upon that I thought It best to enter this competition and follow the wise Ape's words of wisdom, to see if I could win some of this magical 'BeeS Putty' to test out for myself! Just got Piqui's Modelling Stories in Miniature and am inspired to learn to sculpt more than just filling in gaps. And what's more inspiring than a grumpy man and a smoking gorilla? If I don't win I at least challenge you to find me that! Ich will den Kram haben, weil ich finde was du mit dem Putty hergestellt ist hammer und ich würde dieses gerne selber testen. Ich bin zuversichtlich, dass es mir helfen wird, mich weiter im modellieren zu verbessern. sculpting is really new for me, so if I can win this stuff i can be a new Hobby for me. Nice review, ans another clay i'd like to try out. Sadly, god gave me bananas instead of fingers, so each sculpting attempt finishes in some kind of Roman-poo-like sculpt, ans while I succeed sculpting something with an approximatively recognizable form, my monstruous cat always décide to high-five it and let it fall from the top of my cabinet, to finally play with it. Si, for the pleasure of my car, I really would like to try this beeS putty ! Keep on happy reviewing, maintint, sculpting.. Etc ! So there was a quest, ‘bout your own voodoo. I also like the Gorilla and it seems a fitting prize given the MV philosophy. To explain, the gorilla represents a noble and very sociable creature with several attributes of profound wisdom. Combined with the symbolism of the Cigar; wealth, power and status would and could represent MV being at the very top of the metaphorical tree in the modelling community with the willingness to share all the knowledge that the jungle can give. Remember, it’s a jungle out there! Let me Bee The Man to prove the world gorilla comes from bee. Give and you shall receive! Hahahaha.......pretty please..
That's the firts day that my baby is not kept by my wife at home but by a "nanny" (my wife had to go back to work). I could sculpt for my son some stuff, then mold it and copy it in CHOCOLATE!!!! When I was a kid I did so with Dinosaur toys! And my chocolate Dinosaurs were the best chocolates I ever ate. ps: my son eats banana's with a madly love and climb everything at home, that's so funny (and dangerous)! My sculpting skills will get real nutty with BeeS putty! I got Piqui's Modelling Stories in Miniature to create heros and villians that are sinister. That book along with BeeS putty will have me sculpting captain McGillicutty! This aint no lie or Jedi poodoo! Ill be sculpting minis like Roman and Raffa at Massive Voodoo!!! Why? It's quite simple I think. I've been reading articles on this blog for some (quite long) time. The best are those about sculpting. I run blog about sculpting and painting ( akrylem.blogspot.cz ), too. That's why I've tried many putties - just to try it and use it (if I'm satisfied with). BeeS Putty Plastic looks very good. I sent an email to the producer of this putty, but no answer. Well, if this is even a very small chance how to reach the putty, try it and start using it (in the future), I have to give almost a try. But I think if 'Jamal' is in it, too... There's no other way... (BTW: Real Jamal is much more better than the printed one I have already have on my table. It helps to improve my skills. And I really have a few nice images/scenes I'd like to see in 3d from different films (like Disney's Frozen). But I'd need more than a little magic as all my tries in sculpting were pretty bad so far. I want them because why not! This air dried putty? Or in the oven? I have not sculpted anything for years. It all started after my first child was born and I was left with less time and the same appetite for figures. I was buying more than I was painting and it got to the point, where I had to promise I would not buy any new stuff until I build and paint some of my stash. This comment has been put into the oven by the author. 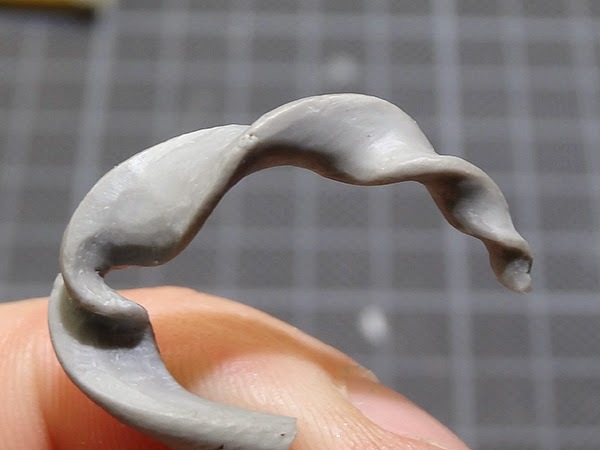 Very simple: because sculpting with it looks like fun! I'd love to try RBIs new product as an aspiring sculptor. Plus since I'm lazy, not needing the greenstuff on the armature makes it that more appealing... Plus show me a man who doesn't want a smoking primate miniature, and I'll show you a fraud! Best lick guys. Thanks for the awesome blog. Ok, this is a sad story, but I think I should finaly tell it to the world. Five years ago I was on a Mission in Columbia to bust an international drug cartel, though my goverment could not act officialy I was on own. After landing in Botogà I had some days bevore I would meet with my local contacts for weapons and stuff, so I went to this nice bar in the eastern district oft he city near the museo del Oro. A nice little thing still there from the colonial period. The instant I entered I noticed this litte chimp, smoking a cigar, drinking his booze. Being verry curious I placed myself near him and ordered the the same after recognicing the brand of brany from its texture and colour and the Cigar by its ashes and smell, a trick I once learned from Sherlock Holmes, but that is another (timetravel) story. So Frank appreciated my taste an we entered into littele conversation about the good things in life. The night went late and we more and more drunk. Another long story short, we spent the night with some nice chicas and the next day with a solid hangover. After some breakfast we departed and I met my local contacts. Two days later, it was night and I deep in the jungel approaching the estate of Don Caliante, one of the most devious drug dealers in the buisness. Knifing the first guards I entered the estate unspottet through a postern gate in the Wall protecting the estate. Though I had cut the power line, it would only take minutes for the emergency generator to step in. So I was forced to act with less care then I would have liked. Avoiding most of the Guards, killing the rest, I entered Don Caliantes mansion. Here the time for secrecy was over, taking my G36, trusting into the german craftsmanship, I stormed the House. After some heavy, but verry short, firefights I entered The Don's office and emediatly I knew there was something verry wrong. My target was sitting absolutely calm in his chair, watching me with his evil grin, cut in two by the scar a tiger had given him in a hand to hand combat in his yunger days. The ligt reflecting on his bold head. "Your time ends here, my friend" he said with his russian accent. Blocking my weapon with a shuriken, a dozen ninjas emerged as if from thin air. Half of the amount I could have engaged easily, but twelve were simply too many. In this moment, cold sweat on my forehead, I thought that at least I would take the Caliante with me. The instant I was ready to attack a little furry ball broke through the window, a shooting ball of death! Killing three off the ninjas instantly Frank brought me back in the game! I klilled my way over to the Don, engaging him in mortal combat, Frank taking care of the last ninjas. Finding an opening in my opponents defence I finished him with the "Five Point Palm Exploding Heart Technique", though he startet laughing making his last steps, screaming: "Long life the Don!" Realising my mistake I pulled down the shirt from the dead body. The birthmark was missing, an imposter! I ran to the window barely in time to seee the real Don Caliante escape with an helicopter. When we were back in Botogà I ask Frank how he had known why I was in Columbia, he tipped his nose and said that he had an feeling, beeing an ex navy seal. It took us two jears, of konstant awesome action to relocate Don Caliante in Miami. Armed to the teeth we once again engaged the Don and his army on there way to meet a weapons dealer. Though we knew that he had hired some pirate-ninjas, normal ninjas obviously not capable handling Frank and me, we were prerared for the worst. Blocking the street by blowing up a bridge, we attackted. Though the pirate ninjas turned out to be only sailing ninjas the Don was soon on his own. Dropping down his weapon Don Caliante challenged us to a hand to hand combat. Frank indicating me that it was his time to fight the Don engaged him, letting loose a furious blow of strikes, forcing his opponent into a defensive position immediatly. Though the Don beeing bigger and much stronger than him Frank had to trust in his agility. Though beeing a tough fight I knew Frank would not want me to intervene. Than in an horrible moment the Don, starting to loose the fight, activatet his electro-shock-jacket. Frank stunned from the shock was unable to dodge the next hit, his little body crashed he went down. I loosing control, let loose my deadliest blows. Through my anger immune to the shocks from the Jacket, his dirty tricks were without help to him. Using the "Monkeygrip", how Frank had called one of the many tricks I hab learned from him, I swung myself arround the Don slinging my legs arround his massive neck. We struggeled for minutes when his strength finaly wore off, with an last effort I snapped his neck and ending his reign. Running over to the dying Frank he grinned. "It was a hell of an awesome monkey live! I thank you for some of the best two jears my friend, is was eral fun." "Frank, I thank you for knowing the most badass Chimp in the world, my friend fare well." I said tears in my eyes. This is my story and though Frank not beeing a gorilla, he had the heart and the way bigger guts then one. So I would like to paint the Gorilla in his remembrance and honor my best and most unique friend. Frank I miss you! 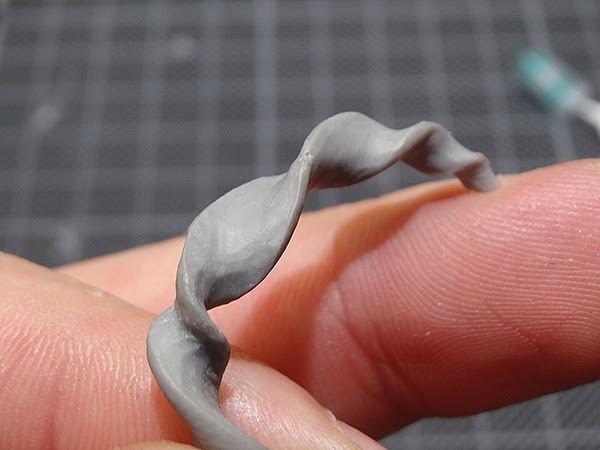 I've only just started sculpting and i would love to try this, i've been using super sculpy to start. Because I'm a Bee and I want my wax back! I'd like to sculpt a 40mm. miniature for my collection. This scale in very poor. :-( I have about 500 pieces but many of them are orrible prepainted from Sabertooth Hex Game. I want it, I need it to create all the monsters that surrounds my head and give them a little bit of space in my house. Ich würde das Zeug sehr gerna haben um es mal zu testen und weiter am modellieren zu feilen. 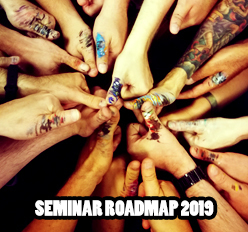 Habe schon viel davon gesehen, aber noch nichts mit gemacht... hoffe auf einen Test auf einem der nächsten Workshops! Because you have to LET IT BEE ! I wish the BeesPutty goes to the right one! No matter if I or someone else get it but I hope we will see a lot cool things out of this cool Stuff! I got a small sample with an order a few months ago. Sadly it was not a big enough sample to do anything serious. Hi, very interesting article - more like this please! 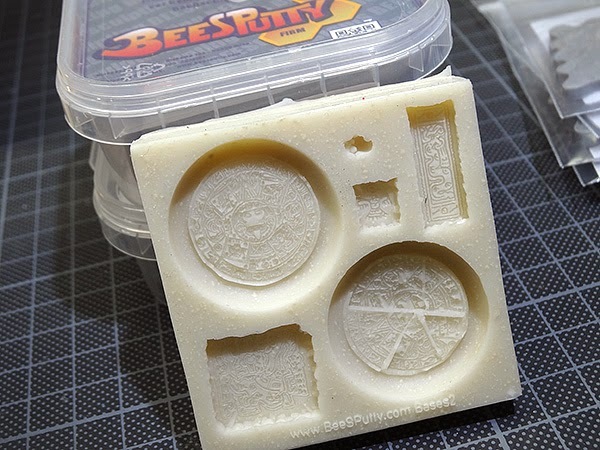 I want to start learning how to sculpt minis in the 54mm scale, and Bees Putty sounds like it would be a great material to get started with. Also, who doesn't want a cigar smoking gorilla? No one I tell you, no one! Thanks again to the crew at Massive Voodoo for another great giveaway and the always present inspiration! Jezz Nick what do you want to do tonight? The same thing we do every night Bee. Try to take over the world! Because I want to become better. I want to try as many of the MV Tutorials as I can to learn and raise my skills. Enjoy and share, your ideas, paintings, sculps... be a part of this awesome family. 'Cause i look like Stromberg (original quote by Raffa^^), so it would be a nice gesture to endure my suffering. Because if I don't get it the bunny will. I have a pet hamster who is called Heimdall, you know, like the hero guardian of the Bifröst in Asgard. He is one mighty fluffy ball of fur! But to be a real hero he definitely needs an arch enemy. Hamsters don't like company of other animals so I think I have to build one for him out of this putty! A mighty Hamster-Loki with a spear no-one's ever seen before. He will be big and scary and unbreakable, so Heimdall will have a tough time with him! There's a passage I got memorized. Ezekiel 25:17. "The path of the righteous man is beset on all sides by the inequities of the selfish and the tyranny of evil men. Blessed is he who, in the name of charity and good will, shepherds the weak through the valley of the darkness, for he is truly his brother's keeper and the finder of lost children. And I will strike down upon thee with great vengeance and furious anger those who attempt to poison and destroy My brothers. And you will know I am the Lord when I lay My vengeance upon you." I'd love to win some of that due to the fact that I haven't really sculpted much in my hobby time, and reading through your stuff always blows my mind. So I'd love a chance to give it a shot and see how far I can push myself into a new medium. i would like to win this putty, 'cause i realy would like to convert Sanne's bust "Jason" to John Candy beeing the "Möter = halb Mensch, halb Köter" (don't know the english version) from Spaceballs.Of course if "Jason" is still in production, or did i miss something? 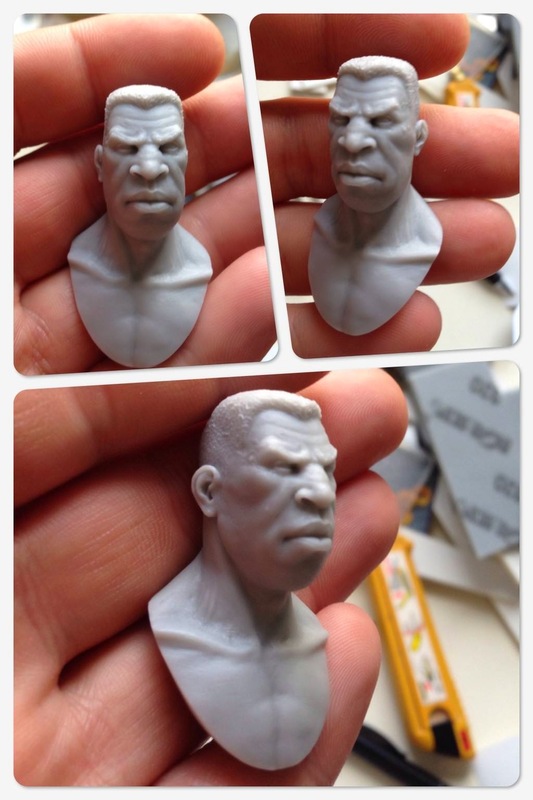 Just getting back into sculpting and would love to try this out and see how it compares to Sculpey Firm. 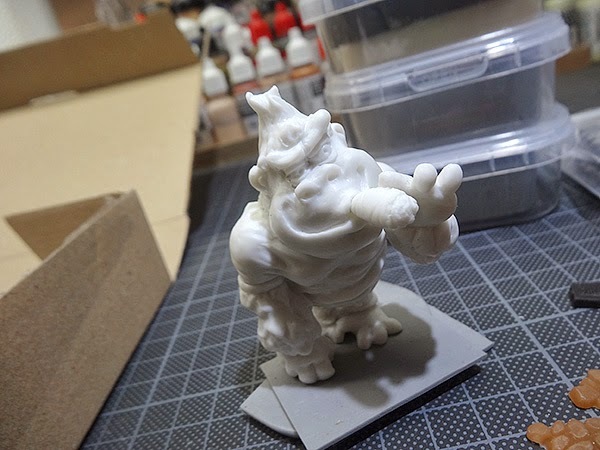 I want to sculpt my own personalized bases and tokens for when I go to painting competitions as a bit of a way to showcase who I am when not standing next to my mini. There's great bananas in the jungle but have you seen a Wild Chevy in the garage? I will not wint his, but can leave a comment. The puty looks quite universal. Could be nice to work with on different stuff. I am just wondering if it would be easy to get it in Poland ? Would have to double check. I tried BeeSPutty medium and I like that, I made a giant squig for bloodbowl and have to be really careful cause the legs cracked. It was my first try at scuplting, so next time I have to make the legs out of something with more flex to them. I loved using BeeSPutty and ordered more, but the plastic type may just be what I'm looking for. I want BeesPutty because "I want that Gorilla to be the Thrilla here in Manila!" This bees' wax...I need to give back to my hive of bees what I took from them! That's why! This counts as baking right? Then surely this is a wholesome activity for all the family to take part in! What do you mean it counts as child labour if the kids do the hard work.......Please dont tell the wife!!!! 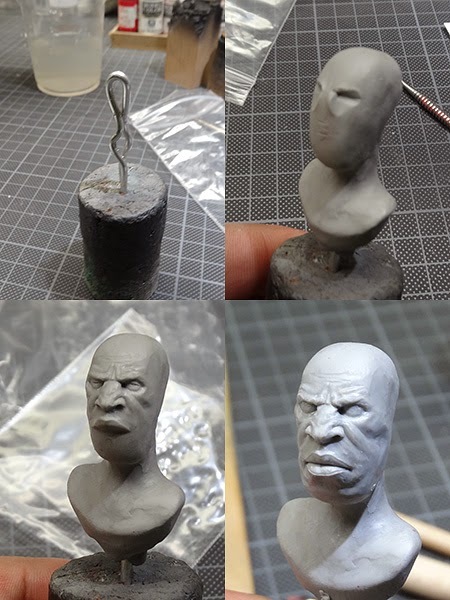 I have never sculpted anything so far.But in thsi review you made it look easy and i would love to have a go and expand my hobby in another dimension.I just need the right material and maybe a nice bust or a gorilla for inspiration? Till now I only used miliput and green suff for sculpting and I would like to give it a go but I have to spend my money wisely ( and its not much) so I cant afford to buy stuff for testing. I've been really wanting to improve my sculpting skills but have been intimidated by the more advanced mediums. This would be a good encouragement to just do it! i want to win the Putty because i want to scup a present for a friend of mine. He and his wife helped me to a difficult time in my life. Hes a big fan of 'Alice im Wunderland', so i want to sculp a Absolem on a mushroom for him as a big ThankYou! 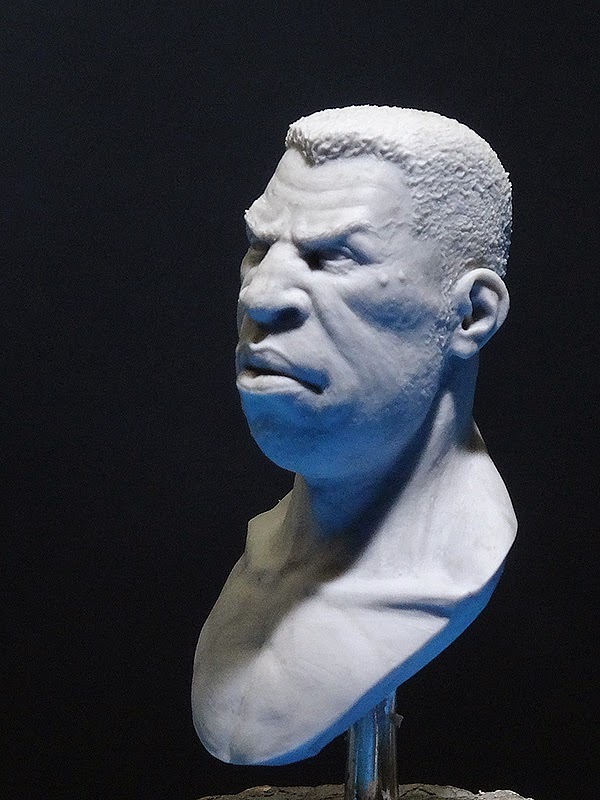 That`s really stunning , during the workshop and while you were painting this( that have been impressive enough ) I didn`t realise that actually also Sculpt this by yourself . I need this for my rocket ship. I'm about to make a trip to the moon to get more basing material for my miniatures. The hull on my ship has a small gap that flexes as I penetrate the lower stratosphere, so whatever I use to patch it has to be nice and pliable. (the heat from re-entry should bake it into place). I've wanted to try this stuff out for a while now, but as a student, I don't really have the bananas for it. And a monkey without bananas is just a hairy, smelly human. I just sculpted my first miniature using Tamiya putty. I would love to make my next one with BeeS putty. your works and posts. You did a good job! Try to visit my site too and enjoy. Been wanting to do some sculpting but was confused with all the putty there is in the market. Seems like this putty came at the right time. Would love to give it a try. Quest Reminder: Can you stamp it! Tutorial Voting: A pirate dreams of gaming bases! Tutorial Voting: A Pirate in a Wolf-costume? Bust - Jamal, and some other news! Tutorial Voting - Arrows to a Pirate's eye!